11 inches x 18 inches Individually packaged in clear poly bag. Approach is too sticky, Shoelaces came undone, The lane is too oily. 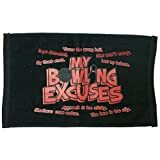 Threw the wrong ball, I got distracted, Pins won't carry, My thumb stuck, Lost my balance, This towel will also help keep the dirt and oil off you ball between shots or after you are done bowling when you clean your ball. What a perfect bowling towel. You will now have every excuse while you are on the lanes! Approach is too sticky, Shoelaces came undone, The lane is too oily.